Rates are current for the 2018-2019 academic year. 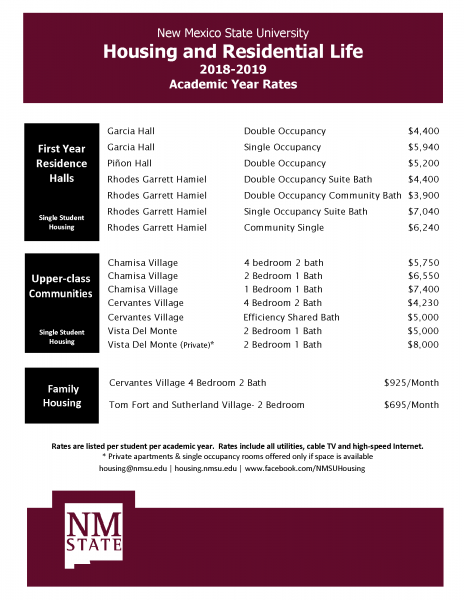 Rates are current for the 2019-2020 academic year. Q: What are Aggie Dining Dollars and how much are they worth? A: Aggie Dining Dollars can be used at most campus restaurants and dining options instead of cash. One Aggie Dining Dollar = $1.00 in value. Q: Can I carry my unused meals to the next semester? A: Meals do not carry over from semester to semester. 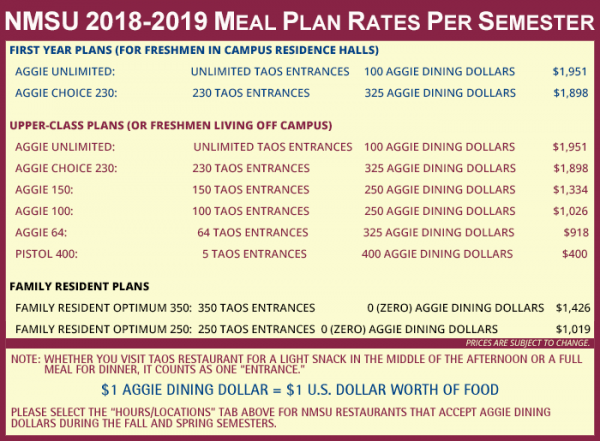 Aggie Dining Dollars carry over from fall to spring of the same academic year only. A: You may change your membership in the first two weeks of each semester. Complete a change of membership form at the ID Card Services Office in Corbett Center Student Union. Q: Can I treat a friend using my Meal Plan? A: You may use your Aggie Dining Dollars to treat a friend at any time. Please inquire with Dining Services if you are interested in obtaining a guest pass for entry to Taos Restaurant. A $15.00 application fee for campus housing and a $200 deposit of rent are due at the time of application. For summer school, the deposit is $200. The housing deposit may be applied toward rental charges, damages; or may be forfeited in the event of Agreement cancellation or Agreement termination. Students living in residence halls or single student apartment complexes are assessed a $14/semester fee. This fee helps support activities of the Resident Hall Association. Campus meal service is required for freshman students living in the residence halls. A $15 application fee is due at the time of application. The meal contract, including refund procedures, is administered through Auxiliary Administration. 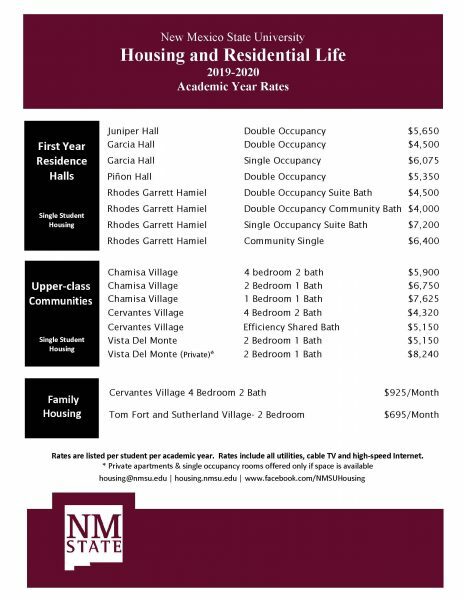 Housing and dining costs are loaded onto the student account that can be accessed through the ebill payment system or at my.nmsu.edu using the student NMSU username and password. The amount due will appear only after a room assignment has been made. Therefore, the earlier a student selects a roommate and/or is assigned a room, the sooner the fees will appear on the student account. Housing and dining fees can be paid in one installment or can be taken care of over the course of the semester. Please note that fees owed for housing and dining are subject to the same terms and conditions as regular tuition. If the student account is not paid in full by the end of the semester, the student may have blocks placed on their account and charges left unpaid for prior terms can result in disenrollment from current term courses unless payment arrangements are made with University Accounts Receivable. In many cases, financial aid or scholarship can be applied to housing and dining costs. To inquire about individual financial aid and/or scholarship packages, please contact the office of University Financial Aid and Scholarship Services directly at 575-646-4105 or 877-278-8586.